If you’re looking for a way to spice up your autumn wardrobe, one of the first places you should “shop” is in your beau’s closet. Why, you ask? Because there’s lots of fashionable accessories in his clothing collection that will look just as great with your outfits as they do with his. Of course, you can also look through your guy’s clothes for inspiration before you head out on your (first) fall fashion shopping trip. Rock Out a Couple of Menswear this Fall! You know those wingtip dress shoes that make your hubby look so dapper? 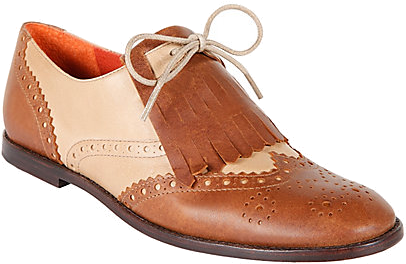 Well, you too can don the same sophistication with the feminine version of wingtips. These Steve Madden beauties are refined yet funky, and look great with a pencil skirt or skinny slacks. You can find these shoes for under $100 on the Steve Madden website, or at fine department stores like Nordstrom.